Collecting a number of years experience in the manufacture of tents catering, market stall, we came to the conclusion that we can enable our customers to trade in the winter months. The solution turned out to be year-round dining options, called pods year-round. The capsule is a universal place for all season market stall, a comfortable trade, even at high freezing temperatures. The relatively quick installation without the need of building foundations, allows for any location of the pavilion. 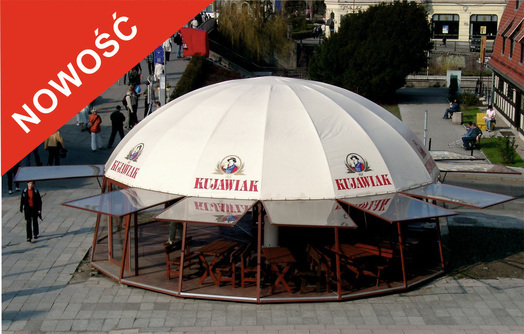 A wide range of colors for both the interior and outer shell, allows an interesting arrangement, and the adjustment of external advertising space to the needs of the buyer. The capsule is glazed sash windows automatically fifteen, filled with plexiglass, which gives an excellent insight into the effect on the environment. Insulated, wood or aluminum floor, along with excellent technique of heating ensures the comfort of staying both warm and cool days. The diameter of the base of 9m. The height at top: 4,5m. The height of the window: 2,03m. Presented capsule is sixteen angle. Sides: construction of sides is based on the flanges steel painted in any color. Windows: fifteen windows, opened independently, supported by gas springs windows are made of aluminum profiles, filled with thick plexiglass. 4.5 mm, lockable steel bolts. Doors: Optional door, single or double-leaf aluminum, glazed with patent lock and self-closing. Dome roof: roof dome structure made of aluminum tubes, bent in an arc, connected in the top of the metal disc. sheathing made of polyester poliwenglanu PVC, any color. Electricity: 220V + optional power. Water system: to be negotiated. Additional elements bar: any shape and furnishings. Suspended ceiling: made of airy fabrics suspended from the roof structure.